An ILD300 kit 1 is for connecting to an existing PA system. Ampetronic ILD300 constant current loop amplifier. 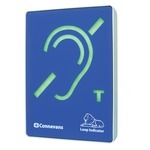 Connevans AFILS loop field strength metre with headphones for routine testing. Suitable for rooms up to 10 x 10 metres.